1 Put lime juice into a mixing bowl. Peel the peach, chop the flesh and toss it in the bowl with the lime juice. Chop nectarines, plums and tomato and add to bowl. 2 Finely chop the chilli. 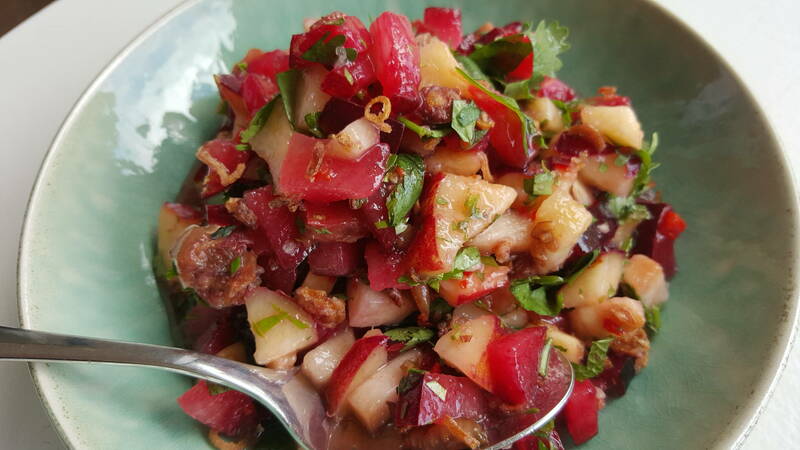 Add to fruit with salt, kaffir lime leaves, mint and coriander. Toss well, sprinkle with shallots, give another light toss, then serve immediately. The salsa needs a real kick of chilli to make it sparkle, so include the seeds. If you don’t have kaffir lime leaves, then use finely grated lime zest. The fruit (including the tomato) is juicy and sweet and is dependent on the punch of chilli, fragrant sharp lick of lime and fresh note of mint and pungency of coriander to bring it together into a gorgeous mouthful. The salsa will work with all white nectarines, or all white peaches, but they must be juicy and sweet. The salsa is best just after tossing because it loses juice as it stands (it’s still tasty like this though).